There are so many great blogs out there that have creative kids food, there's Little Nummies, Gourmet Mom on the Go and Fun Snacks 4 Kids to name a few. 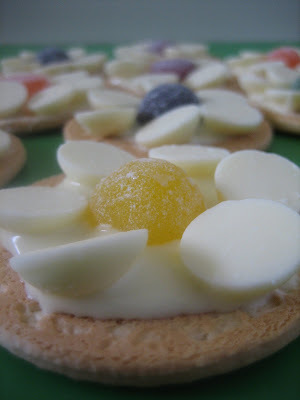 I've been inspired by these blogs to set aside one day a week to post my own creative kids food. You don't have to be a kid to enjoy these fun foods either. I've just realised that Petal snuck an extra button on three of the ones she made. Melt some chocolate buttons in microwave. Spread chocolate on the biscuit leaving the edge chocolate free (if you want). 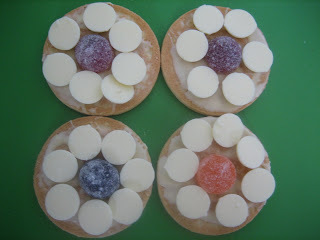 Place a jube in the middle followed by 6 chocolate buttons as petals around the jube. Position buttons on an angle. These were really tasty, even my husband agrees. 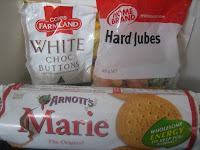 The taste changes depending on the flavour of the jube. The first one I ate had a blackcurrent jube and it tasted like an Iced Vovo (actually it tasted better) and it was soooo good. Next time (yup, there'll be a next time) i'll try fruit pastels, because I think they'll have more flavour than the cheap jubes I bought. I love your blog! I want to eat everything on here! Hi.. 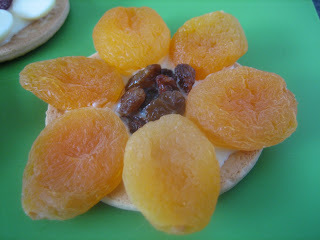 I really like the simple to make and delicious goodies here... Keep it going!! Hi I just saw your comment on my blog. Dry ricotta i meant drained ricotta. :) just amended it. Those are so cute! I would like to link to them on Little Nummies! Heather: Feel free to link to these, that's no probs. If you use a photo, could you use just one - thanks. those are very yummy cookies.